Dentistry has entered an era of high technology with the development of laser energy as a modality in the management of periodontitis and related problems. This is an ongoing and exciting discipline. The evolution of laser therapy for soft tissue manipulation and as an adjuvant in the management of infectious aspects of periodontitis is progressing quite rapidly. But a single laser does not suffice all the needs of dental practice. Thus, photodynamic therapy came into action which involves combined use of photosensitizing drugs and light for treatment of diseases. It implies a role for oxygen-dependent reaction in its mechanism. PDT involves three components: light, a photosensitizer, and tissue oxygen. PDT requires a source of light that activates the photosensitizer by exposure to low-power visible light at a specific wavelength. Laser is the preferred source of light for photodynamic therapy because it emits coherent, monochromatic, intense, and singularly directional light. The commonly used lasers for this therapy are diode laser and helium-neon laser. These low-power lasers are preferred to high-power lasers such as Argon, CO2, Nd: YAG as these cause thermal damage to hard and soft tissue. Cationic porphyrin: 5-phenyl-10, 15, 20 Tris (N-methyl-4-pyridyl) porphyrin chloride (Trip(4)). Presently U.S. Food and Drug Administration has approved only one drug for clinical trial, i.e., Photofrin II a semipurified product of hematoporphyrin (Hp) synthesized by acetylation pr. Selective uptake and retention in diseased tissue. Rapid clearance from normal tissue. Activation at longer, more penetrating wavelength of light. First generation: Hematoporphyrin derivatives and Porfimer sodium. Third generation: Antibody-conjugated photosensitizers and those activated at 700-800 nm wavelength. PDT involves three components: light, a photosensitizer, and oxygen. A photosensitizer or its metabolic precursor is administered to the patient. Upon irradiation with light of a specific wavelength, the photosensitizer undergoes a transition from a low-energy ground state to an excited singlet state. Subsequently, the photosensitizer may decay back to its ground state, with emission of fluorescence, or may undergo a transition to a higher energy triplet state. The triplet state can react with endogenous oxygen to produce singlet oxygen and other radical species, causing a rapid and selective destruction of the target tissue. 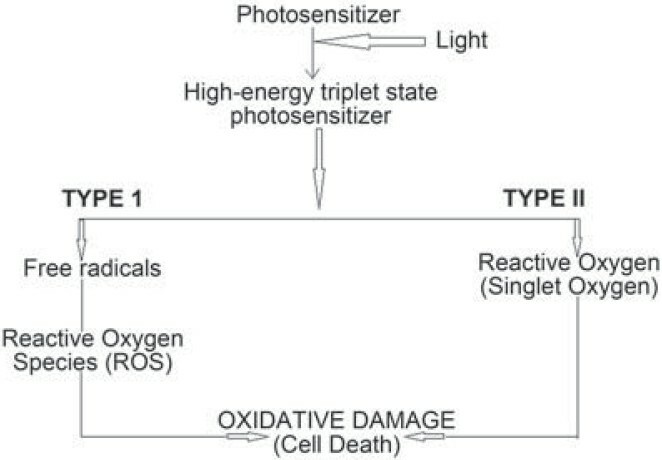 There are two mechanisms by which the triplet-state photosensitizer can react with biomolecules [Figure 1]. It involves electron/hydrogen transfer directly from the photosensitizer, producing ions, or electron/hydrogen removal from a substrate molecule to form free radicals. These radicals react rapidly with oxygen, resulting in the production of highly reactive oxygen species (superoxide, hydroxyl radicals, and hydrogen peroxide). The reactions produce electronically excited and highly reactive state of oxygen known as singlet oxygen. In PDT, it is difficult to distinguish between the two reactions mechanisms. A contribution from both type I and II processes indicates that the mechanism of damage is dependent on both oxygen tension and photosensitizer concentration. Periodontitis is a multifactorial disease. However the role of plaque as etiology for periodontitis has been proved beyond doubt. Clear evidence is now available showing that cells in biofilm are in physiological state that differs from their planktonic counterparts and tend to be less susceptible to antimicrobial agents. This helps to explain why systemically and locally delivered antimicrobials have always been proven unsuccessful, even when they were targeted at specific microorganisms. It also helps to explain why mechanical plaque control and personal oral hygiene have continued to be an integral part of periodontal therapy. Hence even today the periodontal therapy is still based on mechanical plaque therapy. Periodontal therapy includes both nonsurgical and surgical therapies. Use of lasers has made routine periodontal therapy easy and noninvasive. Chronic periodontitis is well suited to treatment by photodynamic therapy. Although most species of oral bacteria are not affected by irradiation, assimilation or adsorption of colored compound by bacteria can sensitize them to radiation  The photosensitizers could be applied to pocket by irrigation and light could be delivered directly or by transillumination  Photodynamic therapy has been found to be effective in vitro against bacteria, yeast, and viruses. Intensive studies are being pursed in order to define the scope and field of application of this approach. Its first use started in dermatology (1992), then in oncology (1995), and then later in microbiology (1996). PDT has showed potential in treatment of the oral lichen planus, oral leukoplakia, psoriasis through the investigations made by Aghahosseini et al. and it was reported that PDT may have immunomodulatory effects and may induce apoptosis in hyper-proliferating inflammatory cells which are present in psoriasis and lichen planus. This may reverse the hyper-proliferation and inflammation of lichen planus. Even Drulis-Kawa et al. demonstrated the application of PDT in inactivation of oral infections. They used Fotolon (chlorin e6) as photosensitizer and used a diode laser for photoactivation. They found that the amount of colony forming unit reduction after PDT was 3-6 logs for Gram-positive bacteria and 2-5 logs for Gram-negative bacteria. Whereas Dobson and Wilson  investigated whether oral bacteria in the biofilm could be sensitized to killing by light from a low-power laser. They used a He-Ne laser with wavelength 632.8 nm and photosensitizers used were patent blue V, crystal violet, methylene blue, hematoporphyrin HCl, and TBO. They found that crystal violet methylene blue, TBO, arianor steel blue, and aluminum disulfonate phthalocyanine were able to sensitize Streptococcus sanguis in the biofilm to killing by laser irradiation for very short period of 10 seconds. They also suggested that the technique was feasible clinically and would offer an alternative to antibiotic and antiseptic therapy, while Bhatti et al. conducted a study using TBO conjugated with antibody against Porphyromonas gingivalis. They used a He-Ne laser with wavelength 632.8 nm. With unconjugated TBO there was reduction in S. sanguis levels compared to P. gingivalis. However when antibody-conjugated TBO was used it led to 100% reduction in P. gingivalis levels. Such an approach could enable killing of periodontal pathogens without collateral damage to host or normal tissue. Also Soukos and Som et al. investigated the effect of broadband light (380-520 nm) on black-pigmented bacteria as well as dental plaque samples from humans with chronic periodontitis. When plaque samples were irradiated P. melaninogenica showed highest susceptibility followed by Prevotella nigrescens, Prevotella intermedia, P. gingivalis. All species had similar patterns of susceptibility. They suggested visible light could be used to stabilize normal microbiota prophylactically suppressing potential pathogens like black-pigmented bacteria. Furthermore Matevski and Weersink et al. investigated the potential of a conventional light source along with TBO and compared effectiveness of this treatment in suppressing P. gingivalis to that of a He-Ne laser in vitro. Conventional red filtered Xenon light is as least as effective as a He-Ne laser and may even significantly improve killing of P. gingivalis. Light intensity and light dose both have been shown to contribute significantly to bacterial killing. Studies have also shown that enough light can be delivered into periodontal pocket using transgingival illumination/irradiation and is capable of activating TBO. Higher TBO concentration increases opacity and prevents complete light penetrance limiting bacterial killing. Peri-implantitis is considered to be a multifactorial process involving bacterial contamination of the implant surface. Dortbudak et al. examined the effectiveness of lethal photosensitization in treating implant surfaces in vivo. The study indicated that photosensitization with TBO plus irradiation with a diode laser for 1 minute resulted in significant bacterial reduction on the plasma-sprayed implant surface and thus can be used successfully for management of periimplant disease. Shibli et al. evaluated the effect of lethal photosensitization and guided bone regeneration on treatment of ligature-induced peri-implantitis in different implant surfaces. This treatment outcome had concluded that the lethal photosensitization associated with GBR allowed for better reosseointegration at the area adjacent to the peri-implant defect regardless of the implant surface. The present study supports the use of PDT as local treatment and an alternative to antibiotic for management of local infection in cases of GBR. Sarkar and Wilson et al. conducted an in vitro study to investigate whether bacteria in subgingival plaque from patients with chronic periodontitis could be sensitized by toluidine blue O to killing by visible light from low power lasers. They concluded that short-term exposure of 30 seconds to light from He-Ne lasers can kill large proportion of bacteria in subgingival plaque once sensitized to TBO. The light also killed P. gingivalis and Fusobacterium nucleatum. A total of 219 mJ of light dose was needed which actually had no effect on bacteria in the absence of photosensitizer, whereas Komerik and Nakanishi et al. conducted an in vivo study and determined that P. gingivalis could be killed by TBO-mediated photosensitization without damage to associated periodontal tissue and to assess whether it would have an effect on bone destruction. They concluded that it is possible to kill P. gingivalis in gingival crevice by topically applied TBO and red light from diode lasers without causing any detectable damage to adjacent tissues. It also significantly reduces bone loss. The florescence study had also shown that the penetration of TBO in periodontal tissues is concentration dependent. Also Pfitzner et al. evaluated a new approach for killing periodontopathogenic bacteria using PDT. They investigated the effect of photosensitizer chlorin on the viability of periodontopathogenic bacterial species by three different methods: (1) examination of inhibition zones on agar plates, (2) determination of colony forming units (CFU), (3) use of a bacterial viability kit. They found that CFU is more effective than other two methods and is able to inactivate the anaerobic bacteria such as P. gingivalis, Fusobacterium nucleatum, Capnocytophaga gingivalis; also the microaerophilic, Gram negative such as Actinobacillus actinomycetemcomitans; and the Gram-negative, facultative aerobic species Eikenella corrodens. Sterer and Feuerstein  investigated the effect of blue light on malodor production. They exposed the bacteria to Xenon light for variable length of time. They found that exposure of mixed salivary micro-flora to blue light for 120 seconds caused a reduction in malodor production. Whereas the team of Braham et al. studied the antimicrobial PDT (aPDT) for the treatment of periodontitis. They demonstrated aPDT treatment can simultaneously kill P. gingivalis and inactivate its virulence-associated protease. They developed a 96-well-based bacterial killing and protease inactivation assay that determined a PDT bactericidal and protease inactivation from the same sample. A cytokine inactivation assay that measured E-selectin expression in response to TNF-a and IL-1b was developed to measure the ability of a PDT to inactivate cytokine function. The results of their studies was that a PDT treatment may augment periodontal treatment by increasing bacterial killing, inactivating bacterial virulence factors, and inactivating host cytokines that impair periodontal restoration. Another study carried out by Sigusch et al. for efficacy of PDT on inflammatory signs. In their study the PDT method was tested with two photo-sensitizers, chlorine e6 and BLC1010, in an experiment on beagle dogs. The PDT carried out on beagle dogs utilizing the photosensitizers chlorine e6 or BLC 1010 and 662 nm laser light led to a significant reduction in redness and bleeding on probing. On the whole, the photodynamic therapy can distinctly reduce periodontal inflammation. Moreover, the species P. gingivalis was noticeably suppressed using chlorine e6. The results show that the methodology presented in this animal model clearly gives rise to hope for a future clinical use in humans. The therapy also causes no adverse effects such as ulcers, sloughing, or charring of oral tissues. Unlike bacterial resistance to chemical antiplaque agent the photodynamic therapy to date has not shown any resistance. PDT is less traumatic and quicker in the treatment of inflammatory periodontal diseases. Necessity for flap operations may be reduced, patient comfort may increase, and treatment time may decrease. Limitations include that it yields no biopsy material, more complex than other treatment. Despite all these limitations, the existing photosensitizers and light sources have achieved significant clinical success, allowing PDT to expand. The future of PDT will depend on the interactions between clinical applications and technological innovations. Allison et al. have described PDT as the therapy that "is truly the marriage of a drug and a light," and, as a result, only interdisciplinary research approaches can overcome all the difficulties and challenges of PDT. The application of photodynamic therapy in management of periodontal diseases is very valuable. The therapy should be combined with nonsurgical therapy such as scaling and root planning. The literature cited above indicates the valuable and novel application and outcome of lasers in management of plaque-induced periodontal diseases without any adverse effects. 1. Wintner E, Strabl M. Basic Information on Lasers. Oral Laser Application. In: Moritz A, Editor, Oral Laser Application. Berlin: Quintessence Berlin; 2006. p. 1-2. 2. Mahajan A. Lasers in Periodontics. A Review. Eur J Dent Med 2011;3:1-11. 3. Myers TD. What lasers can do for dentistry and you. Dent Manage 1989;29:26-8. 4. von Tappeiner H, Jodlbauer A. Ueber die wirkung der photodynamischen (fluorescierenden) stoffe auf protozoen und enzyme. Arch Klin Med 1904;80:427-87. 5. Lui H, Anderson RR. Photodynamic Therapy in Dermatology: Recent Developments. Dermatol Clin 1993;11:1-13. 6. Michael B, Sano K, Inokuchi T. Effects of Photodynamic Therapy in the Normal Mouse Tongue. J Oral Maxillofac Surg 1993;51:1129-34. 7. Doughtery TJ. Photosensitizers: Therapy and detection of Malignant tumours. Photochem Photobiol 1987;45:879-89. 8. Verheyen P, Blum R, Goharkhay K, Walsh LJ. Photoactivated Disinfection. In: Moritz A, Editor, Oral Laser Application. Quintessence Berlin; 2006. p. 503-19 . 9. Bhatti M, MacRobert A, Henderson B, Shepherd P, Cridland J, Wilson M. Antibody- Targeted Lethal Photosensitization of Prophyromonas gingivalis. Antimicrob Agents Chemother 2000;44:2615-8. 10. Soukos NS, Ximenez-Fyvie LA, Hamblin MR, Socransky SS, Hasan T. Targeted Antimicrobial Photochemotherapy. Antimicrob Agents Chemother 1998;42:2595-601. 11. Takasaki AA, Aoki A, Mizutani K, Schwarz F, Sculean A, Wang C, et al. Application of antimicrobial photodynamic therapy in periodontal and peri-implant diseases. Periodontol 2000 2009;51:1-32. 12. Konopka K, Goslinski T. Photodynamic Therapy in Dentistry. J Dent Res 2007;86:694. 13. Zanin IC, Maristela ML, Rodrigues LK, Pimenta LA, Hofling JF, Goncalves RB. Photosensitization of in vitro Biofilms by Toluidine Blue o combined with a light emitting diode. Eur. J Oral Sci 2006;114;64-9. 14. Overman PR. Biofilm: A New View of Plaque. J Contemp Dent Pract 2000;1:18-29. 15. Dobson J, Wilson M. Sensitization of Oral Bacteria in Biofilm to Killing by Light from a Low Power Laser. Archs Oral Biol 1992;37:883-7. 16. Sarkar S. Wilson M. Lethal Photosensitization of bacteria in subgingival plaque from patients with chronic periodontitis. J Periodont Res 1993;28:204-10. 17. Aghahosseini F, Arbabi-Kalati F, Fashtami LA, Fateh M, Djavid GE. Treatment of oral lichen planus with photodynamic therapy mediated methylene blue: A case report. Med Oral Patol Oral Cir Bucal 2006;11:126-9. 18. Drulis- Kawa Z, Bednarkiewicz A, Bugla-Ploskonska G, Strek W, Doroszkiewicz W. The susceptibility of Anaerobic Bacteria Isolated from Periodontal Diseases to Photodynamic Inactivation with Fotolon (Chlorin e6). Pol J Microbiol 2005;54:305-10. 19. Soukos NS, Som S, Abernethy AD, Ruggiero K, Dunham J, Lee C, et al. Phototargeting Oral Black-Pigmented Bacteria. Antimicrob Agents Chemother 2005;49:1391-6. 20. Matevski D, Weersink R, Tenenbaum HC, Wilson B, Ellen RP, Lepine G. Lethal photosensitization of periodontal pathogens by a red-filtered Xenon lamp in vitro. J Periodont Res 2003;38:428-35. 21. Dortbudak O, Haas R, Bernhart T, Mailath- Pokorny G. Lethal photosensitization for decontamination of implant surfaces in the treatment of peri-implantitis. Clin Oral Impl Res 2001;12:104-8. 22. Shibli JA, Martins MC, Ribeiro FS, Garcia VG, Nociti Jr FH, Marcantonio Jr E. Lethal photosensitization and guided bone regeneration in treatment of peri-implantitis: An experimental study in dogs. Clin Oral Impl Res 2006;17:273-81. 23. Komerik N, Nakanishi H, MacRobert AJ, Henderson B, Speight P, Wilson M. In Vivo Killing of Porphyromonas gingivalis by Toluidine Blue-Mediated Photosensitization in an Animal Model. Antimicrob Agents Chemother 2003;47:932-40. 24. Pfitzner A, Sigusch B, Albrecht V, Glockmann E. Killing of Periodontopathogenic Bacteria by Photgenic Therapy. J Periodontol 2004:75:1343-9. 25. Sterer N, Feuerstein O. Effect of visible light on malodor production by mixed oral microflora. J Med Microbiol 2005;54:1225-9. 26. Braham P, Herron C, Street C, Darveau R. Antimicrobial Photodynamic Therapy may Promote Periodontal Healing Through Multiple Mechanisms. J Periodontol 2009;80:1790-8. 27. Sigusch B, Pfitzner A, Albrecht V, Glockmann E. Efficacy of Photodynamic Therapy on Inflammatory Signs and Two Selected Periodontopathogenic Species in a Beagle Dig Model. J Periodontol 2005;76:1100-5. 28. Shackley DC, Whitehurst C, Clarke NW, Betts C, Moore JV. Photodynamic therapy. J R Soc Med 1999;92:562-5. 29. Allison RR, Bagnato VS, Cuenca R, Downie GH, Sibata CH. The future of photodynamic therapy in oncology. Future Oncol 2006;2:53-71.